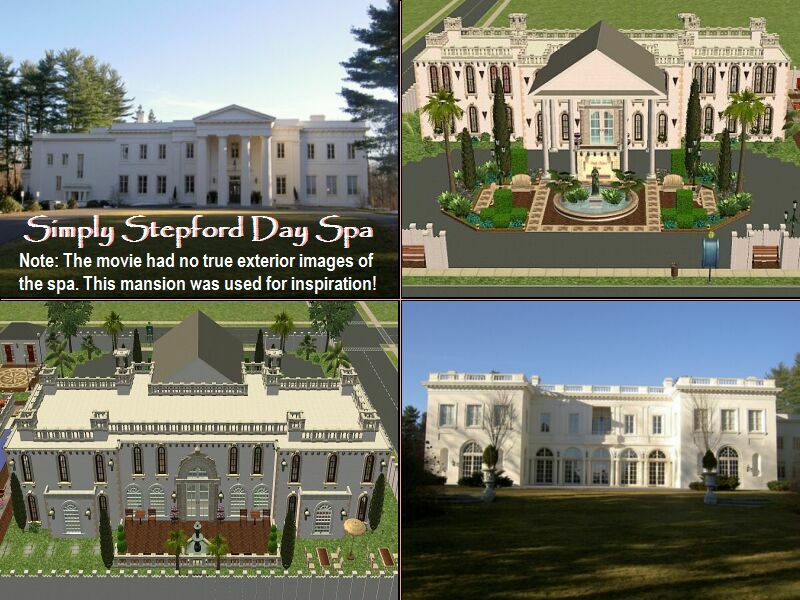 Mod The Sims - The Stepford Project II: Community Social Clubs by D.D.I. 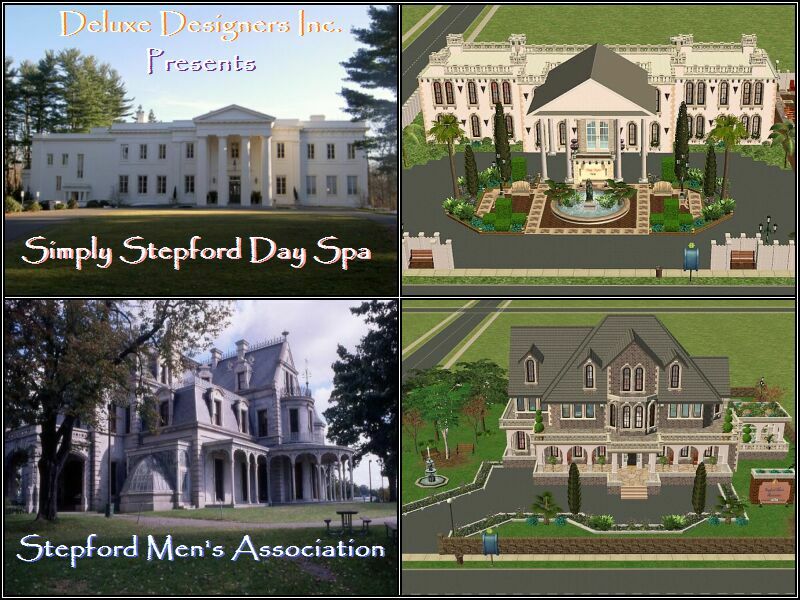 This is Part 2 and includes: The Simply Stepford Day Spa and The Stepford Men's Association. Enjoy the downloads! There are 2 community lots in this download. 1 lot is a women's club and the other is a men's club. 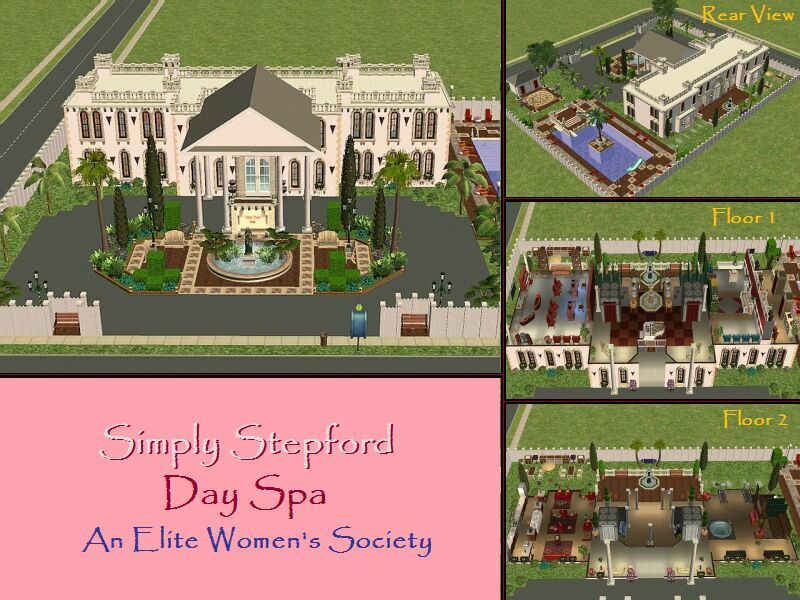 There is 1 version of the women's club, the Simply Stepford Day Spa. 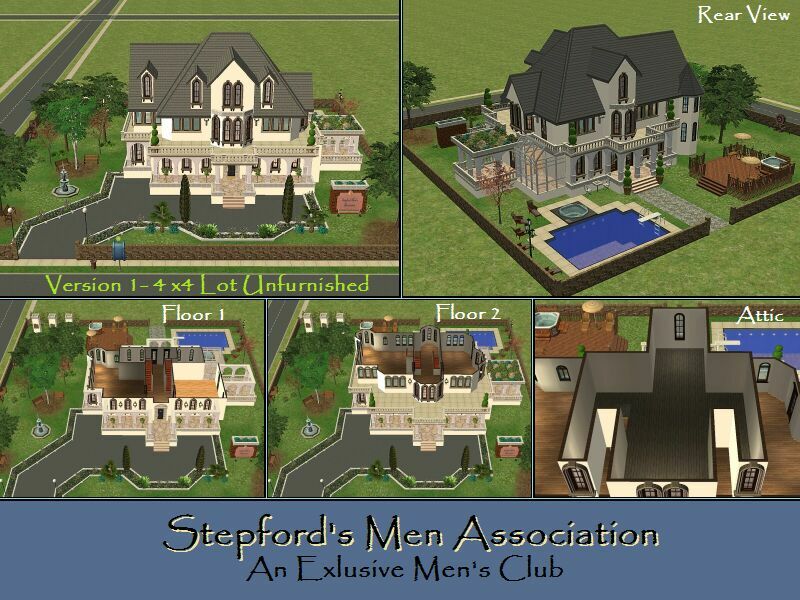 There are 3 versions of the men's club, the Stepford Men's Association. 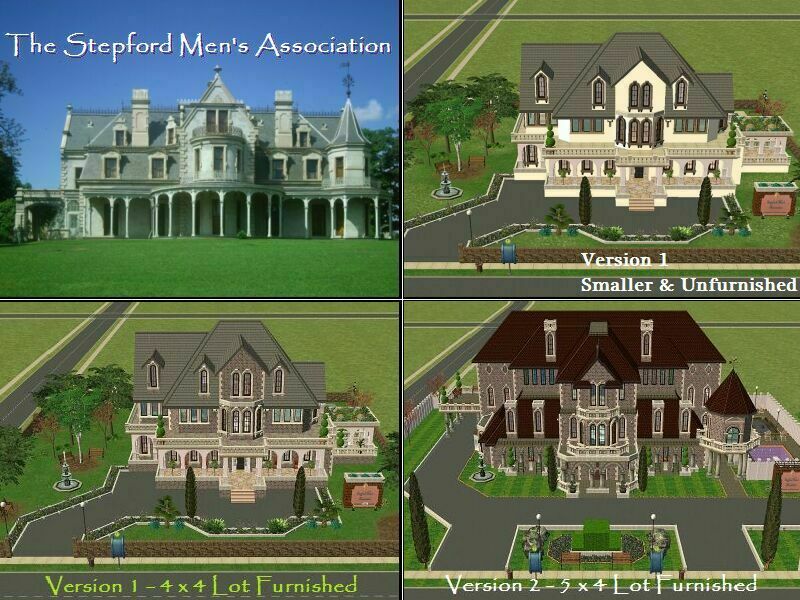 There is an unfurnished version on a 4 x 4 lot, a furnished version on a 4 x 4 lot and a furnished version on a 5 x 4 lot. Since these are Community lots, the driveways are completely decorative! Note: There are 3 versions of the Men's Association. 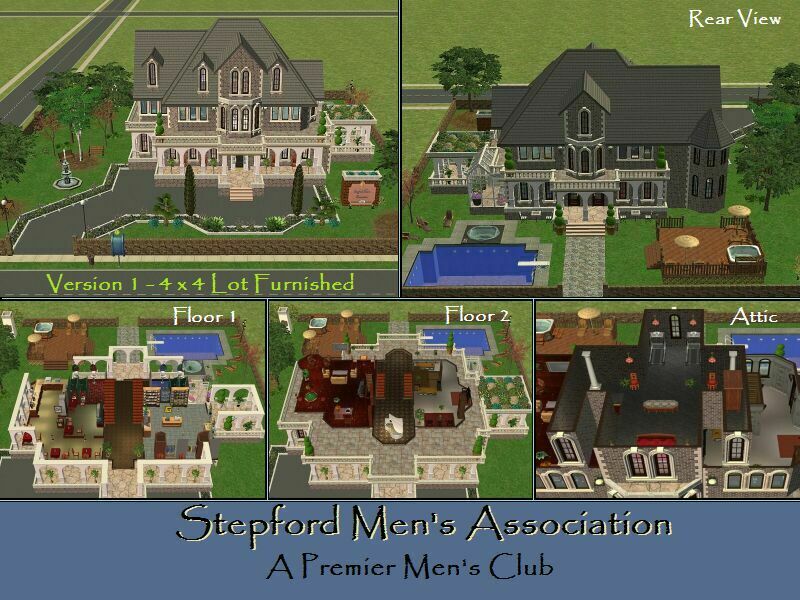 Scroll down to the attached images and click on Clubs03 to see a side by side comparison of the lots to help you decide which version you prefer. Keep in mind the lot size and whether or not you want a furnished lot or an unfurnished lot! 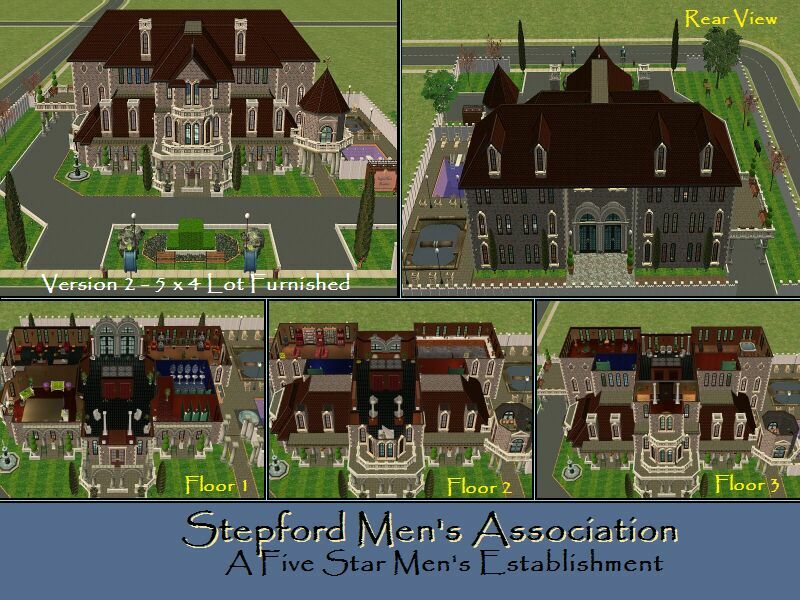 Or if you just can't decide, download all 3 Men's Associations! Thank you to the following artists for helping to bring this Sim lot to life: Mia86, Ailias, Xrax, Marvine, Mzcynnamon, Phoenix_Phaerie and Macarossi. Be sure to browse the links at the end of the post for other fabulous downloads by each artist! These lots contain Minimal to Moderate Custom Content. Keep in mind there are 4 lots here and the custom content listed below is not included in every lot. In addition, we only included build mode items (walls, floors, terrains, doors, windows, flowers, trees and stairs). The main build mode objects used are Phoenix_Phaerie's Georgian Set and Macarossi's Classical Windows and Doors (both with relatively low poly counts). There are no custom furnishings included. All furniture is Maxis/EA. Any custom content used has been tested in the game for playability. 195 people have said thanks to Deluxe Designers Inc. for this download.